Air/Oil Separators for rotary screw andvane type air compressors provide the ultimate filtration, with amicron rating of 0.3. All particles passing through the air andlube oil filters, which are larger than 0.3 microns, will betrapped by the separator. Separators are constructed of a depthloading media, and have good dirt holding capabilities. The basic purpose of this product is toseparate the oil from the air through coalescing action. The oil isphysically trapped by the separator while allowing air to passthrough. The oil is then drained down to the sump, removed by thepickup tube and return lines, and returned to the sump to berecompressed in a continuous cycle. 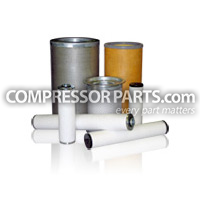 Our Air/Oil Separator Replacements comewith a manufacturer's warranty that matches or exceeds the originalOEM warranty.